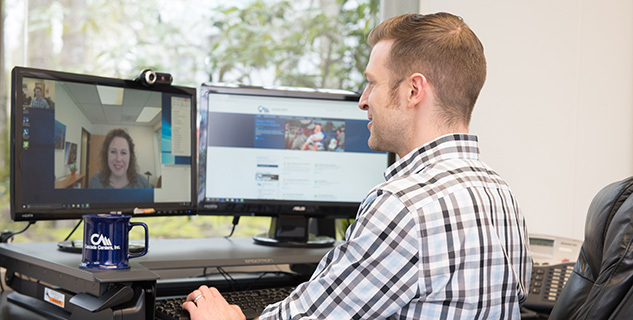 Cascade uses the latest tools of technology to establish and maintain the confidentiality of information exchanged through online conference services. Data is protected at the highest allowable level using secure 128 bit socket layer (SSL) encryption software to keep your communication with us completely secure. This is the same level of security as online banks. Users correspond with their online EAP consultant through our secure website in a Private Conference Area. All chat accounts are protected by usernames and passwords. If you are concerned about your privacy in using this service, write info@cascadecenters.com or call toll–free 1–800–433–2320. While we use the latest in internet security technology to ensure privacy, Cascade EAP is not liable for breaches of confidentiality due to access by unknown parties, due to computer related technical difficulties, or due to the user's failure to remove internet addresses or private e–mail transactions from shared or public computers. If the user contacts the EAP for online support from a computer in the workplace, the user should know that employers commonly audit the destination addresses of e–mail transactions and internet sites. E–mail from or received by an employee at work is generally considered to be the property of the employer. The user should be aware of these factors if there is a concern about privacy. Online support is not available to individuals under the age of 18. – By your written authorization (you may want your information forwarded to a counselor you are seeing in person). – By law we are legally obligated to report to appropriate authorities any suspicion of child abuse or abuse of an elderly person. – By law we are legally obligated to report to the appropriate authorities any incident where a life is in danger. – By law we must respond to any court ordered subpoena of our records. Contact us at esupport@cascadecenters.com. You will be contacted within 24 business hours to schedule an appointment. Once that appointment is scheduled you will be emailed a guest URL address. This is the link that will allow you to enter your “room” with the EAP consultant at your appointment time. Once you have an appointment time scheduled you will be emailed a guest URL (a link). At your appointment time you will click on that link. Once you click on the link, you will be asked to set–up a username and password. After you set up your username and password you will view your counseling room. You click on the link for the counseling room and you and your EAP consultant will begin your communication session. The length of the session varies. A session can last anywhere from 10 minutes to 50 minutes. Is my counseling session confidential? Data is protected at the highest allowable level using secure 128 bit socket layer (SSL) encryption software to keep your communication with us completely secure. This is the same level of security as online banks. Users correspond with their E–Consultant through our secure website in a Private Conference Area. All chat accounts are protected by usernames and passwords. If you are concerned about your privacy in using this service, write esupport@cascadecenters.com or call us toll–free at 1–800–433–2320. Online counseling is considered experimental at this point. Because a therapist cannot see or hear clients in cyberspace, there are many important clues that are missing using this medium. These visual and auditory clues include facial expression, body language, and the tone of voice. Therefore, the EAP Consultant's perceptions are limited by the written information the user supplies. Because of this limitation, online support is not a therapy. Therefore people in need of a therapeutic relationship must seek treatment from a licensed professional within their own community. When should I seek traditional mental health treatment rather than an E–Support? – If you are in an abusive, violent relationship. – If you have been seriously and deeply depressed. – If you are having thoughts of hurting yourself (i.e. suicidal thoughts), someone else (i.e violent thoughts toward others), or psychotic symptoms. – If alcohol or drug abuse is involved. – If you are a minor (under 18 years old). NOTE: The conditions listed above are not appropriate for online support. Call Cascade EAP at 1–800–433–2320 so that we can assist you in finding the services you need. What are the advantages of E–Support? If you have a difficult schedule or out of town commitments, you may find this format more convenient. The obvious advantage of E–Support is that you do not need to leave your home or office, or coordinate an appointment with an EAP consultant. You may also find that writing questions out may be helpful in making a problem seem clearer and might facilitate more honest exploration. Also, our clients that have used this format, indicate they appreciate having the suggestions available to print out to encourage them months later. – Flexible scheduling. Your schedule is keeping you from getting to an appointment with counselor in person. – Anonymity. Some people are nervous or embarrassed about meeting with someone in person. – Easier communication. Some people find online communication gives them a way to talk about things that they might not have otherwise talked about. – Confidentiality. Some people find it more comfortable receiving support in the privacy of their home. – Resolution to problems. You may write about what is bothering you sooner than if you were talking. This can bring faster resolutions to problems. – Solution focused. Writing may help you to think through your problems. It can bring focus, clarity, insight, and relief. – Review of progress. You can read and re–read your emails, and chat transcripts. Who are the EAP Consultants? All EAP consultants providing E–Support have a masters level or above and a minimum of five years of EAP experience. With the privacy of E–Support, any question of a non–medical nature can be asked. The most frequent questions we get are regarding relationships. Other popular questions people send are about low self–esteem, anxiety, depression, sadness, conflicts, improving communication, coping with loneliness, and more. All questions lead to understanding yourself better so your relationship with others improves. If you're not sure about how to describe your situation, look at our suggestions on making a counseling request, submit it, and if we're unable to answer your question, we'll assist you in finding someone in your area to help you. What web browsers are compatible with E–Support services? E–Support requires Internet Explorer, Safari, or Firefox. It does not work with Internet Explorer 5x. Other browsers may or may not work, but only the three listed are guaranteed compatible. Do my E–Support sessions count against my total EAP sessions allowed? Yes. E–Support sessions are counted as part of your EAP sessions. What if I have a question about this counseling service that isn't answered here? Please contact esupport@cascadecenters.com or call 1–800–433–2320 with any questions or concerns you may have. Services offered online by Cascade are supportive, educational, and solution–focused. The intent is to assist in assessing the user's problem and making a referral for ongoing treatment if needed. There are instances where online support is not an appropriate service. Online support is not a crisis service and does not take the place of face–to–face behavioral healthcare services.